The holidays can be a stressful time for people of all ages, at home and at work. Families are juggling additional obligations, travel plans, and financial commitments. This stress can be compounded by the fact that many agencies face end-of-year deadlines and financial requirements and youth service workers are helping young people also facing stress and possibly dealing with loss and grief. December’s tip sheet (available to National Safe Place Network members) highlights the ways you can support your employees and colleagues during this time of year, and how you can support the youth you serve. Express gratitude. Simply saying “thank you” to staff and colleagues and offering words of encouragement can go a long way to increase morale during the holidays. It may also help to highlight achievements of colleagues and staff during the previous year since some may be facing anxiety about finances and person accomplishments heading into the new year. Often times we have a moment that we find ourselves reflecting upon the furthest and most recent moments of our lives. These moments can make us smile, laugh, cry… but most of all, they can remind us of our gratitude towards someone. Each year, we (the NSPN/RHYTTAC staff) have such a blast planning and hosting the National RHY Grantees conference for you. As the time grows closer, we become very eager to see the hard work come to fruition. The thing we are most excited for however, is seeing and connecting with each of you. We see you arrive to the conference, excited to be in a new place, excited to see old friends and meet new colleagues, and exited to learn! During the first day we see it… the SPARK. It’s a contagious spark that spreads like wildfire through each and every one of you. This SPARK is INSPIRATION. During the end of the conference, yes, you are tired from all the great activities and intriguing training workshops, but during the end of the conference you can’t help but to see, hear, and FEEL the inspiration that flows through you. What you take back to your fellow staff, organization, and community is something that can change lives. Yes, our friends – what we look forward to the most is you and your inspiration to make a difference in the RHY world! Thank you for allowing us to be a part of the difference you make in so many lives. If you missed the conference or would like a reminder of how much fun we had… here are a few videos created during the conference, including our Video Blog from the night of the RHYA Anniversary Celebration! Speak confidently. Avoid getting softer at the end of sentences. Try to start and end strongly. Also avoid raising your pitch at the end of sentences, turning it into a question. National Safe Place Network members with Training Center access can read the entire document, “Tips for Becoming an Authentic Speaker,” by logging into your membership account at www.nspnetwork.org and accessing the NSPN resource center. We’re excited to share our new NSPN Communications Vlog! We are excited to announce our new NSPN Communications Vlog! Want us to share something specific? Let us know! You know the look. If you have been around a while you have seen it hundreds if not thousands of times. You are meeting someone new and you are asked what it is that you do. Struggling to find the simplest, most straightforward answer, you might say…”I work with youth”. The person might ask for more…perhaps, “Are you a teacher?” and while the answer is yes, you are – you may probably say – no, I work in a shelter (substitute group home, residential treatment center, outpatient counseling, wilderness camp, after school program or…) and then, wait for it….the look. The look is one filled with first bemusement, then questions and then the moment of “oh, that must be rewarding – I couldn’t do it” or “these kids today – they just need discipline” or maybe even “you must be a saint to deal with those little terrors”. Audits can cause anxiety among staff and executive leadership. Here are two tips from our member tip sheet – “15 Tips for Surviving an Audit.” To see all 15 tips, you must be an NSPN member with the organizational development package. If you have this package, check out the full tip sheet by logging into your membership account at www.nspnetwork.org and accessing the NSPN Resource Center! Know the users of your external audited financial statements and why your organization requires an audit. Your audited financial statements could be required by your organization’s by-laws and be used exclusively for internal purposes. They could also be intended for external use by contributors, for securing loans or collateral agreements with banks, or they may be fulfilling certain regulatory filing requirements as a result of annuity programs, federal fund resources, or state solicitations, etc. Knowing the intended use will help you target your auditing activities. Do your homework: Choose the right auditor for your organization’s needs. Nonprofit organizations come in all shapes and sizes, with different accounting and reporting needs. Some organizations have simple structures operating only one or two programs, small staffs, and predictable transaction streams. Others can be extremely complex with multiple needs and issues. Auditors are not a “one size fits all” market, hence the variance in their pricing. Organizations would benefit from doing a little research and selecting from a pool of auditors that uniquely fits their needs. You may even save some money. It’s time for a Brain Break! On NSPNsights, we are excited to provide you with a “Brain Break” from time to time. Brain Breaks can be fun tips, trivia questions, games, recipes, or the like. 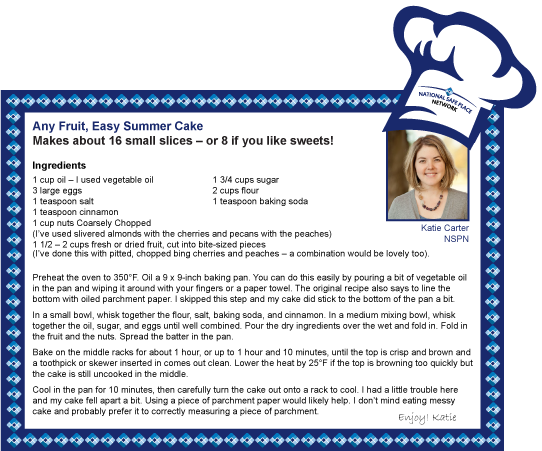 Today, we have a recipe from our new Director of Research, Education and Public Policy – Katie Carter. We look forward to “serving” you lots more Brain Breaks! Why is Twitter important for your organization? Twitter is a great way to promote your organization and connect to a network of people doing similar work. It is designed with simplicity in mind – where short and sweet messages come across better than complex communication. How do you launch a new organization? Wow…a question requiring a long answer and it is a very good thing that I don’t have to provide it! How do you bring together 2 long term partners to form one entity – united – toward a common mission? Well, now, I can write about that. 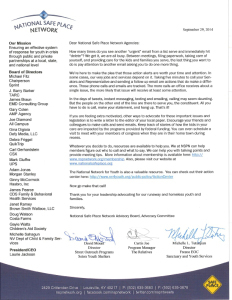 It is no secret that National Safe Place and the Youth and Family Services Network (YFSN) are now one. I think we were always of a shared mind – we just operated with different EIN numbers. There was so much agreement in terms of our commitment to youth; our dedication to partnering with youth and family service organizations; our belief that collaboration has longer term benefits that competition; and, well – the list goes on. There were also differences. National Safe Place had more than 30 years of experience in partnering with communities to expand and strengthen a safety net for youth. A national effort built on the concept of a simple sign with a critical message. Today, there are hundreds of communities, thousands of Safe Place sites and a shared belief that any youth in crisis must be able to seek out and receive immediate assistance or in other words – “Someplace to Go. Someone to Help”. YFSN had more than 30 years of experience creating a network of support, capacity building and benefits for organizations. As an association consisting of agencies working daily to provide critical needs and services to youth and families, YFSN developed an extensive history of capacity building, training, technical assistance, consultation and funding initiatives. YFSN also established a culture that lived the “Together We Can” motto of learning from each other and understanding that each and every organization within the membership has something valuable to share and in doing so, everyone wins.